Hummingbird Nectar Recipe - The Perfect Mix! It’s simple to whip up your own hummingbird nectar recipe. The basic recipe is 1 part white table sugar to 4 parts water. That’s it! If only it was that simple. There’s still more to know to ensure you don’t endanger those fantastic buzzing flying jewels in your backyard or garden. It’s best to use tap water. Use a softener on your tap water? You could consider using purified or filtered water. Don’t use distilled water, though. The simplest way to make your hummingbird mixture is to stir your sugar into warm tap water. Some folks like to boil the water first as a purifying step. Even though it is not necessary, it is still perfectly fine to do this. Consider that you may boil off some of your water. Check your 1:4 ratio to ensure your sugar water still has the correct mixture. 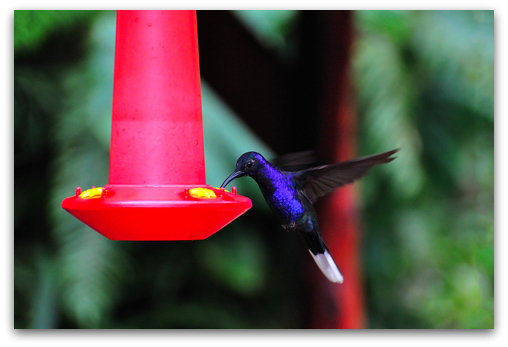 The sweeter mixture won’t hurt your hummers but it could clog your feeder more easily as it may more quickly ferment. Boiling the water may help reduce the advent of fermentation but realize that the mixture becomes contaminated the moment your first bird dips in to feed. Take extra care to allow the mixture to cool before placing it out in feeders. Fermentation starts faster with warm nectar and very hot mixtures can crack your feeder. You can place it in the fridge overnight to be extra sure. You can store unused nectar for about 7 days. Don’t make too much at once. Your hummingbird nectar recipe shouldn’t ever include items such as molasses, sugar substitutes, brown sugar or honey. Hummers can’t properly digest molasses or honey. They can ferment fast and create harmful mold. Substitutes lack the proper caloric energy. I encourage you to stay away from commercial nectar products, too. While they all sound great when talking about vitamins and flavors, none of these ingredients are needed by your flying jewels. Those commercial products won’t be any more effective than sugar water at attracting hummingbirds either. I wouldn’t worry about adding red dye to your hummingbird nectar recipe. It’s just not necessary. Your feeder will attract them with its red color. Most red dye has ingredients harmful to humans and hummers alike. It’s imperative to clean your feeders often. It’s a privilege to create a haven for hummingbirds and it’s a great responsibility to ensure they’re safely feeding with you. Especially when it’s hot, the sugar solution can only last about 2 or 3 days before mold becomes a possibility. Be sure to fill your feeders with only enough to last that long. Each time you refill them rinse them out thoroughly with very hot water. Once in a while you can use mild soap if you need to. Always rinse extremely well. Keeping your feeders clean and full of non-moldy nectar is important for two reasons: it keeps your hummers healthy and it keeps them around (they’ll leave if their food source becomes toxic). Follow my above tips and you’ll enjoy a flurry of hummingbird activity!